Coffee will never replace tea in my affections. 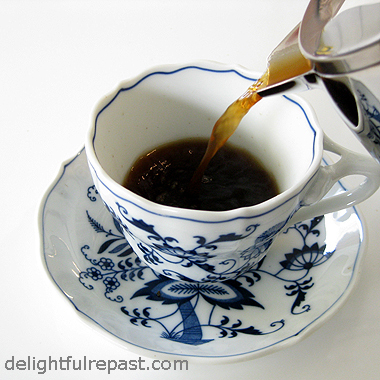 Coffee is more of an acquaintance I enjoy seeing from time to time, while tea is my constant companion. Never one to grab a quick cup of coffee or drink it bleary-eyed in the morning, I do enjoy a well-made cup of coffee as the perfect complement to certain things. Like chocolate. Or beignets, which have been on my mind a lot lately. (I'll post my recipe another day.) I remember well the first time I had beignets and cafe au lait in New Orleans. It was several years ago, but I can still smell and taste that classic combination. Growing up in an English home, my mother was a tea drinker until she met my coffee-drinking Southern-born father (and married him 16 days later!). Of course, she continued to prefer tea but drank coffee in the morning since she was obliged to make it anyway. She learned her coffee-making technique from him just as he had learned it from his parents. This will likely come as a shock to you, but it was boiled coffee! Also known as cowboy coffee. Sounds terrible (and probably is most of the time), but can be very good if done properly. And, of course, my mother made it properly. But I always figured I'd botch the cowboy coffee, so I decided I'd go with the manual filter method and got a 1-litre thermal carafe and a Melitta filter. I've been using that for years on those occasions when I make coffee. Then a friend, who once worked as a barista and is a true coffee aficionado, told me she thinks French press coffee is the best. She has the Bodum Chambord glass model and loves it, but I can be a bit of a hazard so I was happy that the model sent to me for review was all stainless steel. 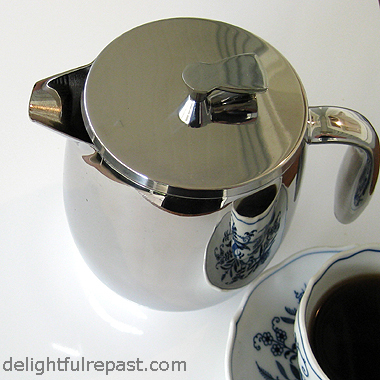 It is the Bodum Columbia cafetiere/French press. The Columbia comes in three sizes: 17-ounce, 34-ounce and 51-ounce. Mine is the 17-ounce, which is going to be perfect for my dear sister-in-law's morning coffee when she comes to visit. I've only used it a few times so far, but I like it so well I'm thinking of getting the 51-ounce as well. It's so easy to use, and the coffee is perfect. Its gorgeous rounded shape suits my traditional style more than the more modern-looking cylindrical shape of some of the other Bodum press pots. Of course, it is cylindrical inside so that the press can work. The double-walled construction helps keep the coffee hot longer. Both the pot and the lid/plunger are dishwasher-safe, though I just wash them by hand. 1 Remove lid/press from pot. Measure 1/4 to 1/3 cup coarsely ground coffee into pot. 2 Heat 16 ounces of water in tea kettle. When almost to a boil, pour into pot; give it a stir. Set the lid/press just loosely on the pot. Let stand for 4 minutes. 3 Place the lid/press properly on the pot. Slowly press the plunger. What is your favorite method for making coffee? And decaf or regular? Strong or weak? Black or ... ? Scads of cookbooks are published every year. Some good, some not so good. I'm not here to tell you about many of them. After all, I post to this blog just once a week as a rule. But when I come across one that is truly special in some way, I want you to hear about it. I get lots of offers of books, but I accept for review only the few that promise to be exceptional. (And my accepting a book does not obligate me to write about or recommend it.) 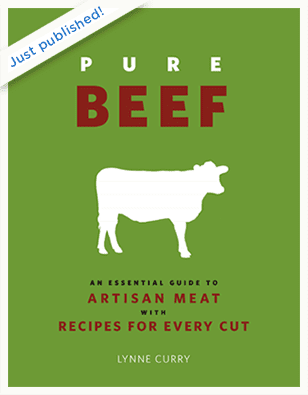 I read about Pure Beef: An Essential Guide to Artisan Meat with Recipes for Every Cut and about its author before deciding to accept it. One of the things that caught my attention was that author Lynne Curry is a former vegetarian. I've been vegetarian at various times of my life and never felt good about eating meat until ethically, sustainably, humanely raised and harvested grassfed meats became available. In Part 1, the part I was most interested in, Curry (in her very non-preachy way) makes the case for grassfed beef and covers all the issues beef consumers need to know. 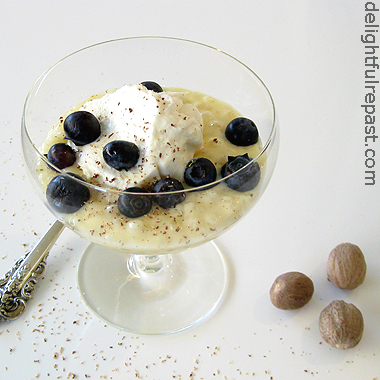 Part 2, the part with the recipes, is where the surprise came in. 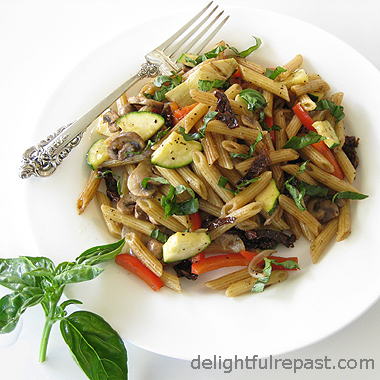 I see so many poorly written recipes and recipes that were obviously never actually made by anyone, let alone tested, that I'm surprised when I find a collection of really good recipes like this. Curry's recipes for every cut, even the under-appreciated and lesser known ones, are clearly written and represent a wide range of global influences. From perfect grassfed hamburgers to porcini-rubbed tenderloin with saba sauce and braised lentils. Whether you're interested in the grassfed movement or just looking for some good beef recipes, you won't be disappointed. One winner will receive a copy of Pure Beef from Running Press. All US residents who leave a comment (one entry per person)--and DO make it a "real" comment, something meaningful--on this post before 11:59 pm Eastern time Wednesday July 11 will be put into a random drawing. Winner will be announced here in the comments before noon Eastern time on Thursday July 12. (Note: Those posting comments anonymously must include a valid email address in their comment to be eligible for the drawing.) If I don't hear back from the winner of the random drawing by 11:59 am Eastern time Sunday, July 15, another drawing will be held and a new winner selected from the original entrants (those who commented before the giveaway deadline). Disclosure: A copy of this book was sent to me for review purposes. I was not required to post about it and received no compensation for doing so. 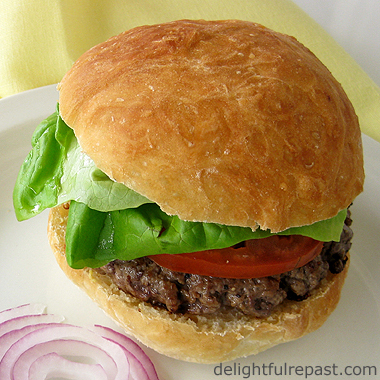 Note: The burger in the photo is grassfed ground beef on my Homemade Hamburger Buns.